We like making old houses ready for their next 125 years. 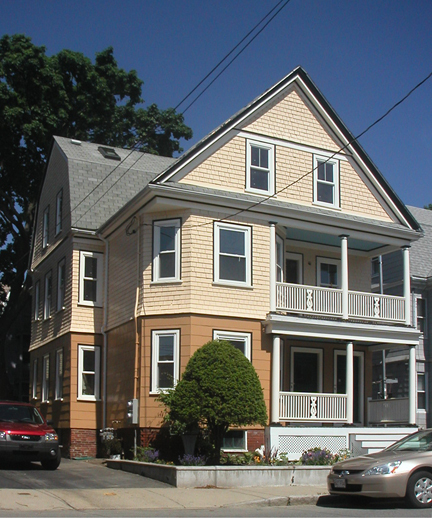 Our 2008-2009 project house is a 1895 Philadelphia style house. It is an 11 minute walk to the Davis Square Red Line via the Minuteman Bike Path which is located 2 blocks away. It’s a 3 minute walk to the Ball Square future T stop. It’s on a low traffic street. There is off street parking. The first unit is a sunny 2 bedroom, 1and 1/2 baths with 1300 square feet. It has 5 rooms. Every surface has been restored. We restored all the existing woodwork and replicated the woodwork where new construction was added. The unit has high ceilings and pocket doors. We restored the front facade and porch. There is also a rear porch and yard. The second unit is larger at 2000 square feet. It has seven rooms with 3 bedrooms and 2 and 1/2 baths. The unit has high ceilings, pocket doors and a stained glass window in the front hallway. The laundry hook-up is in the unit. There is rear stair access to the cellar, driveway and backyard. There are porches on the front and back. Basement storage is approx. 500 square feet per unit and divided for private access. This is a view of the kitchen from the dining room. This is a view from the rear of the kitchen towards the adjoining dining room. This is the built-in hutch in the dining room. In the background is the full bath and front hallway of the unit. This the third floor front bedroom, which we consider the master. It has two built-in units and a built-in cubby. The room also has two walk-in closets. This is the middle bedroom on the third floor. It has a closet and two operable skylights. This is the third floor back bedroom. Where the chimney once was is now a built-in cabinet. Next to the built-in is a closet. This is the third floor full bath. This view is from inside the bathroom looking at the built-in storage. This is the third floor full bath viewed from the hallway. The ceiling contains an operating skylight. The bathtub/shower is all ceramic tile.